Working Families is a charity helping parents, carers and employers find a better balance between responsibilities at home and work. Since 2016, DIAS have provided Working Families with strategic, technical and creative support. Central to our relationship is the question "How can we help you use 'digital' better?". In the time we've been working together, we’ve held workshops to understand how each of the organisation's internal departments can use digital to streamline their services. 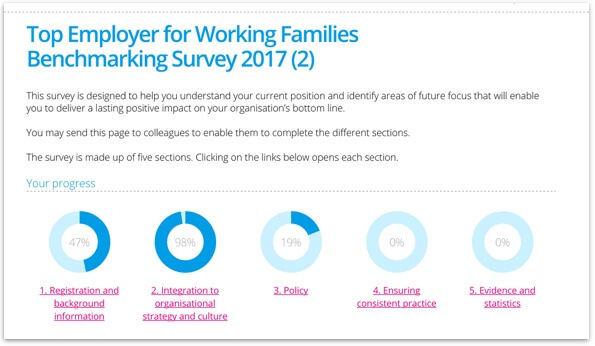 We’ve overhauled the workingfamilies.org.uk navigation system and redesigned and built their annual Top Employers Benchmarking Survey. Working closely with their team, we’ve also improved their case study library and created a video casebook on Shared Parental Leave. As part of their communication campaign, DIAS developed two fun and engaging animations to help them spread the word on work/life balance and parental employment rights. You can watch them below.